ENSENADA, Mexico – Another challenging SCORE Baja race course has been identified and is being marked for the opening of pre-running. Entries continue to climb as the deadline to register in time for the start draw is nearing. And teams are finalizing crews and logistics for this month’s 31st annual SCORE San Felipe 250 desert race in Baja California, Mexico. Early entries from 21 U.S. States, host Mexico, Austria, Canada, Germany and Guatemala are preparing for the popular season-opener of the four-race internationally-televised 2017 SCORE World Desert Championship. The event will be held March 29-April 2 in San Felipe, the quaint fishing village on the Sea of Cortez, 125 miles south of the U.S. Border at Calexico, Calif. SCORE has also announced that it has finalized a major new U.S. television agreement which will be announced prior to the upcoming race. The deadline for entering to be included in the start draw within each class is Wednesday, March 15, the drawing is Thursday, March 16 and pre-running will open on the magnificent course of nearly 265 miles on Saturday, March 18. Online registration will continue until Sunday, Sept. 26 and on-site, late registration will be held March 29, March 30 and March 31. The 2017 season also marks the 50th anniversary celebration of the legendary season-ending SCORE Baja 1000, the iconic Granddaddy of all Desert Races to be held in mid-November. The SCORE Baja 1000 is the longest continuously held desert race in the world. Celebrating the 31st anniversary of the youngest of the three legendary SCORE Baja races, sometimes referred to as the SCORE ‘baby Baja’, entries continue to be accepted on the SCORE website (www.SCOREInternational.com) for Pro and Sportsman entries for cars, trucks, UTVs, motorcycles and quads. Pre-race festivities for this popular ‘Spring Break’ race will be held in San Felipe on March 29, March 30 and March 31 with race day on Saturday, April 1 concluding with the post-race awards fiesta at 10 a.m. PT on Sunday, April 2. The Monster Energy SCORE Kickoff Welcome Party will be held from 7 p.m. to 11 p.m. PDT on Thursday (March 30) at XXXXXXXXX. Racer registration will be held at the Hotel El Cortez from 4 p.m. to 8 p.m. (PDT) on Wednesday (March 29), from Noon to 8 p.m. (PDT) on Thursday and from 9 a.m. to 4 p.m. (PDT) on Friday (March 31). Media registration will be held at the Hotel El Cortez from 1 p.m. to 5 p.m. (PDT) on Thursday (March 30) and from 9 a.m. to 4 p.m. (PDT) on Friday (March 31). The pre-race Manufacturer’s Midway, contingency and tech inspection of the vehicles in the race will be held on Friday (March 31). Contingency will run from 9 a.m. to 5 p.m. (PT) and tech/transponder check from 9 a.m. to 6 p.m. on the picturesque Malecon, flanked by the Sea of Cortez on one side and the popular restaurants and night clubs of San Felipe on the other. For the first time in the history of this race, SCORE will hold a qualifying session on Thursday, March 30 to determine the starting positions within each class for the SCORE Trophy Truck, Class 1 and Trophy Truck Spec classes. 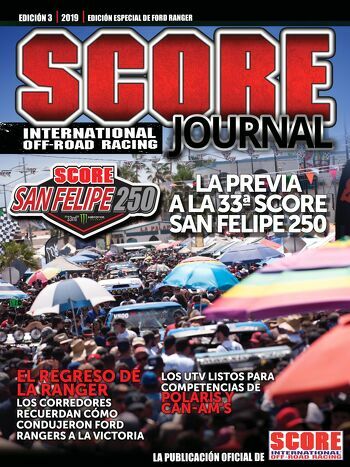 SCORE President Roger Norman and SCORE Race Director Jose A. Grijalva have worked with the government officials and ejidos of the Mexicali and San Felipe areas to develop a memorable SCORE San Felipe 250 race course of approximately 270 miles. This year’s grueling race course will be another beauty to behold but a tough challenge to race on. It runs in a counter clockwise direction running over high-speed dry lake beds, through low-speed winding, rock-strewn, twisting canyons and trails, along quick-paced dirt roads and through three of Baja’s most infamous washes in Chanate, Huatamote and Amarillo. There will be two full stop checkpoints in addition to the start/finish line which will be located for the first time in the history of this race on the Malecon in the heart of San Felipe. Checkpoint 1 will be located at El Chinero and the second will be at Morelia Junction. The course will also pass through La Ventana, Saldana and Borrego as well as the Diablo dry lake bed. There will be two road crossings, both on Highway 3. The first will be going north at km 192 after checkpoint 1 and the second one coming south near Borrego, crossing at km 179 on the highway. The start line and celebratory finish area will be on the SCORE ramps in front of the Rockodile night club on the Malecon. Five racers have won three overall victories in the SCORE San Felipe 250, a standard which may last for years to come. The most recent racer to win overall three times in San Felipe was Mexico’s Gus Vildosola Jr, who won three straight (2013, 2014, 2015). Vildosola Jr is now tied with four Las Vegas racers with three overall wins each in this race. A second generation Mexican desert racer, Vildosola Jr of Mexicali has five class wins in this race including in the No. 21 Vildosola Racing Branix Ford Raptor SCORE Trophy Truck. Vildosola Jr, with help from his father Gus Sr in 2013 won his first overall. He drove solo the next two years to tie the record in 2015 of three straight overall wins set by Las Vegas racing brothers Ed Herbst and Tim Herbst who won three straight in 1999, 2000 and 2001. The Herbst brothers have four class wins in San Felipe as they also won Class 1 in 1995. Three other Southern Nevada drivers have three overall wins in San Felipe but not three straight. Leading the other Las Vegas three-timers in overall victories is Rob MacCachren, who has eight class wins in San Felipe and won all three of his overall titles in the featured SCORE Trophy Truck division. MacCachren’s first was in 2007 when his split the driving with Mark Post and his most recent overalls in San Felipe were solo wins in 2011 and 2012. MacCachren, who has won three straight overall victories in the SCORE Baja 1000, drives the No. 11 MacCachren Motorsports Rockstar Ford F-150. Post is the third Las Vegan with triple overall wins in San Felipe (1998, 2004, 2007). He drove a Class 1 car to victory in 1998 with Jerry Whelchel and a SCORE Trophy Truck to the overall in 2004 with Whelchel again. This year Post has entered this race with Ed Herbst as his second drive as the dynamic duo will drive the No. 3 Riviera Racing Ford F-150. The final Las Vegas three-timer in San Felipe is Brian Collins, who won his first in 1990 in Class 1 while splitting driving time with SCORE Baja motorcycle racing legend Jack Johnson, also of Las Vegas. Collins also captured two straight in SCORE Trophy Truck in 2008 and 2009. Both Collins and Johnson have retired from SCORE Baja racing. For three decades, the annual motorsports festival that has brought the largest economic impact of any single event held annually in this lightly-populated portion of the ruggedly rough and bountifully beautiful Baja peninsula has been the SCORE San Felipe 250. Official SCORE Sponsors: BFGoodrich Tires-Official Tire, Monster Energy-Official Energy Drink, Bud Light-Official Beer, King Shocks-Official Shock Absorber, Raceline Wheels-Official Wheel, Axial R/C-Official R/C Vehicle, Wide Open Excursions-Official Arrive and Drive Company, Crystal Bay Casino-Official Casino.